Oceans One Condominiums are an affordable option in Daytona Beach Shores and conveniently located near food stores, banks, Walgreens and many excellent restaurants. 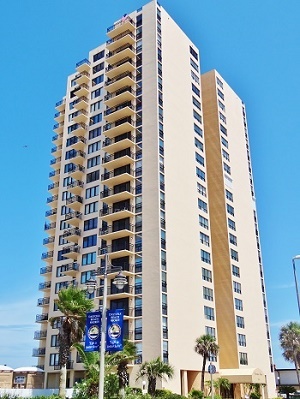 This 22 floor condominium building has 120 units with penthouse availability. No pets welcome and assocation allows 3 month minimum rentals. Units provide magnificent views of the Atlantic Ocean and Halifax River with prices starting under $200k! Two and Three bedroom floor plans are available. Major renovations have recently taken place on this complex. The assocation has restored and painted the exterior, replaced balcony railings, added pavers to the pool decking, installed new elevators, as well as new tile and fixtures throughout the lobby.